Facebook is planning to take over as Russia’s No.1 social network, and it’s enlisting an army of app developers to help it get there. Facebook is hoping that by bringing Russia’s emerging group of app developers to its site, their users will follow. Russia has been a difficult market for Facebook to break into. The country is dominated by two sites: VKontakte and LiveJournal. 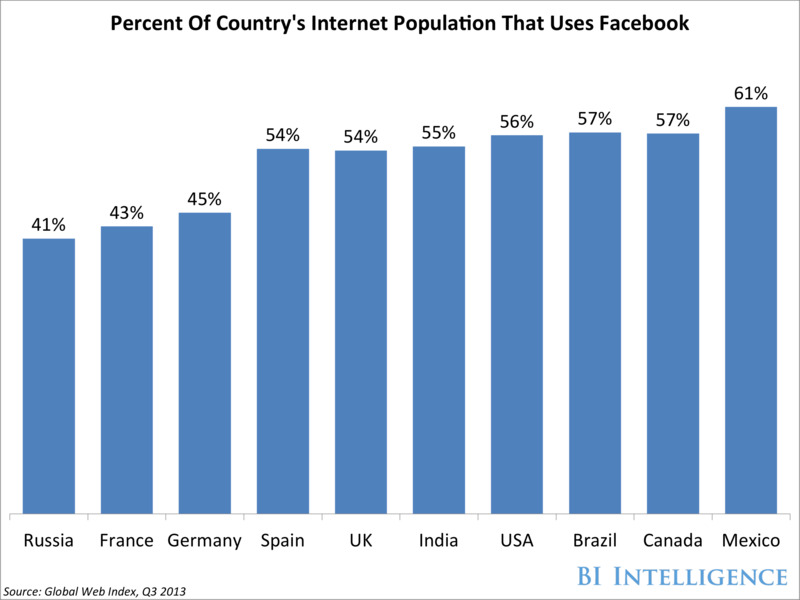 As the chart below shows, Facebook doesn’t have a virtual social network monopoly in Russia like it does elsewhere in the world. VKontakte, Russia’s most popular social network, is often dubbed “the Russian Facebook.” The site’s founder, Pavel Durov, was forced to flee Russia in April 2014 after he refused to allow government attempts to spy on users through the site. Now, VKontakte is controlled by two investors with close ties to the Russian government. In Russia, Facebook is a new gaming platform. 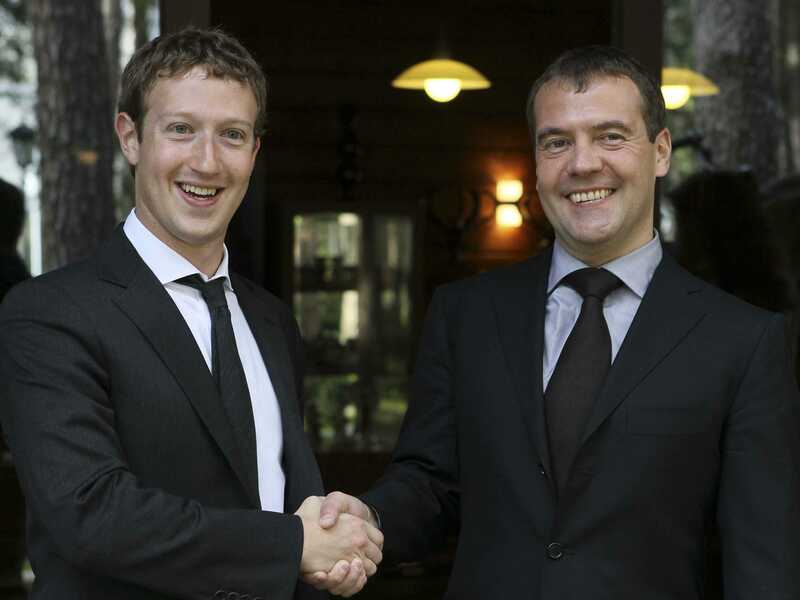 The first time we went to Russia with Mark Zuckerberg, we had one Russian company on Facebook. We said: “Guys, there is a place where you could reach a global market.” In the 12 months that followed that trip to Russia, we’ve seen a tsunami of Russian companies coming onto Facebook. 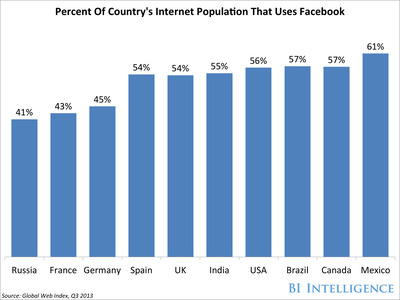 From a platform perspective, we go and tell Russian developers that Facebook is the place where they can go global. You can be the king of Russia with VK, but it won’t help you to get payers from the US. Facebook can help you get those kinds of payers and players. When they look at the success stories of developers that went from VK and then to Facebook then to mobile. I was actually thinking of who launched on Android first, and there is a pattern coming from Eastern Europe. The Russian developers develop on Android first because of a big audience, and it maybe being easier to develop. They liked the fact that they could submit a new version of the app every day. This is a trend that I see and I think it is going to accelerate. The quality coming from Eastern Europe is very good too. When I say Russia, I’m also including the Ukraine. Look at Wargaming, the most profitable gaming company of all time, it’s based in Minsk. You would not expect that. If you have one trip to make, go to Eastern Europe and Israel. This is where the next billion dollar companies will come from, I can tell you.